The Suwannee River is one of the great rivers of the world. The name, Suwannee, is a very ancient Indian word that meant "echo". It has become legendary, and is considered synonymous with the old south and Dixie. 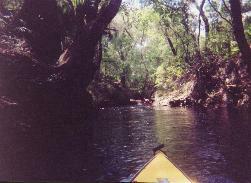 The upper Suwannee drains out of the dark and mysterious Okefenokee Swamp. Starting as a twisting river, it loops and curves across the Florida peninsula for over 200 miles before emptying into the Gulf of Mexico. The upper section features sandy banks, rocky shoals, a profusion of small waterfalls from the limerock (the waterfalls come from small streams and groundwater). Huge cypress trees and tupelos are seen along the river and its banks. The current is slow and lazy. The water has a deep brown tea color (called a "tannin" color), due to the decomposition of leaves that have fallen into the river. We spot several gorgeous native Florida flame and pink pixter azaleas along the banks on our spring paddle. Along the way are several large oaks, whose branches are filled with spanish moss. Almost all species of native trees in north Florida can be seen along the river. There are 42 types of mammals, 54 fish species, 39 types of amphibians, and 232 types of birds along the river. The river drains 9,630 square miles. 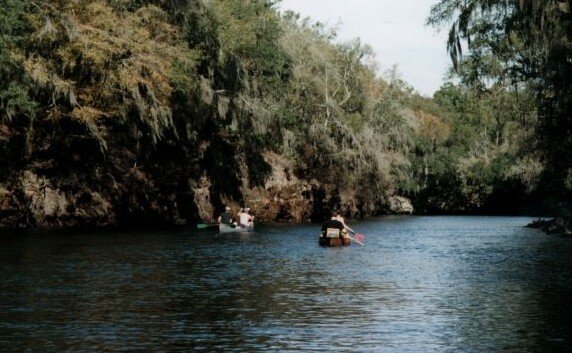 The river was made famous by the Stephen Foster ballad "Way Down Upon the Suwannee River." In the late 1980s, the Suwannee River Water Management District purchased 17,630 acres at a cost of $11 million to help preserve the river for future generations. In 1987, Robert Browning proposed to build 4,000 campsites, called Suwannee Trails Camp, Resort along the river, but a firestorm of opposition from environmentalist opposition stopped the plan. A unique feature is "Big Shoals," just above White Springs, which is the largest whitewater shoal in Florida. It can be a challenging canoe or kayak experience (canoe rental companies advise against trying to canoe it). I camp on the bright white sandy shoals along the river banks, and find such camping highly enjoyable. Several times, I have swum in the river to cool off on hot summer days. 1998: I enjoy an outstanding canoe trip down this historic river. We choose an upper segment, which contains the famous "Big Shoals" area. The scenery is lovely. We paddle through an undeveloped and quiet corridor lined with forest/river vegetation such as fringe trees (native tree with white frothy blooms). We also see alligator, turtles, and osprey. The segment is so undeveloped, in fact, that I'm sure it looks very much like it did several generations ago when all those famous stories and songs were being written about it (a rare sight in rapidly growing Florida).We enjoy a picnic lunch along a sugar-white natural sandy beach along the river, and have no complaints about the picture-perfect weather. I'm already looking forward to going back again. The lower section begins at Suwannee River State Park and continues for 51.4 miles. The lower section is wider, more tranquil, and gentle than the upper section, and slightly more developed. A group of 3 of us kayak a rarely paddled, relatively uncharted and unknown tributary to the Suwannee River called Deep Creek. Despite the dry summer the area has had, the namesake of the creek gives us water that is sufficiently deep to travel via kayak. Earlier in the day, we have misgivings, but our desire for a new adventure urges us on. It turns out to be a pleasant surprise. Deep Creek is a gorgeous, intimate creek that is a perfect size for kayaking, is fairly quiet, and is removed from other boaters. We see no other boats during our 4 miles along the creek, and little evidence that others had traversed the creek in the past. The two photos (to the right and below) show what this extremely attractive creek looks like. In many ways, Deep Creek is a miniature version of the Suwannee River. Several limestone outcroppings, lined with impressive and diverse forests, many sandbars, and a deep, chocolate-colored water (tannic acid is the obvious influence). Our trip along Deep Creek takes about 3 glorious hours. We enjoy running through a number of rushing Florida-style "waterfalls"—which consists of an abrupt drop of 2-4 feet. (Fairly unusual and enjoyable for us Florida flatlanders.) We have a relatively large red-shouldered hawk lead us down the creek, sometimes perching in the tree just above us in the creek. We see several otter and turtles, a couple of deer, and a number of turkey vultures. In only a couple of spots do we need to portage over downed trees, logs or limestone, despite the low water. A large network of beautiful trails for hiking a bicycling can be found along the majestic, historic Suwannee River. They provide excellent examples of "The Real Florida." 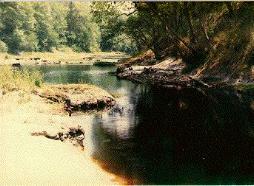 The Suwannee is a large river with coffee-colored water. This fabled river, made famous in the song by Stephen Foster over 150 years ago, flows more than 230 miles across Florida from its origin in the Okefenokee Swamp (the biggest swamp in North America) in Georgia to its destination in the Gulf of Mexico. Along the way, it is fed by more than 22 major springs - many of which offer diving, snorkeling, picnic, and swimming opportunities. 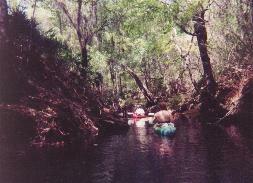 Along the way are Big Shoals and Little Shoals, the only river rapids in Florida. The river flows through pristine river swamp with tall cypress, oaks, pines, and palmettos. Along bends in the river, you often find white sand beaches, many of which make excellent camp sites. Limestone outcrops line the banks. Ancient ocean fossils in the limestone are evidence of a time when the shoreline extended further inland and the sea covered much of present-day Florida. Parts of the Florida trail and a network of off-road bicycling trails parallel the river. The off-road bicycling trails include 15 separate riding areas featuring a variety of forest ecosystems, palmetto thickets, pine forests, oak hammocks, and cypress swamps. Find old beaver dams, hidden springs, and glimpses of the blackwater Suwannee River along mountain bicycle trails that are second only to the Santos trails in all of Florida. The bicycle trails provide what is perhaps the most scenic mountain biking in Florida. Here, one can experience high bluffs, magnificent floodplain oak forests draped with Spanish moss, ravines, and unforgettable views of the mighty Suwannee River. Most all of the publicly-owned lands where these trails are found were acquired by the Save Our Rivers program. The program manages and protects river water quality by establishing these conservation lands. Found along the Suwannee River are stupendous stands of oak and longleaf pine forest. Much of the sandy floor of the trails is sugar white sand that Florida is famous for. These forests provide habitat for fox, deer, bobcat, possum, raccoon, otter, gopher tortoise and a vast array of bird species, including warblers, screech owls, hawks, woodpeckers, osprey, heron and eagles. One of the trails here is known as the Allen Mill Pond Spring. The run was the site of a mill starting in 1855. The mill used the creek to power the grinding of corn. Its beams can still be seen in the spring run. Also found here are the grounds that contained the home of Lewis M. Mosley, a trading post and a ferry, and known as Mosley's, Allen's, and Old McCall Ferry. The Mosley home was used as a resting place for John C. Breckenridge, a Confederate leader who was trying to escape from the pursuit of Federals at the end of the Civil War.